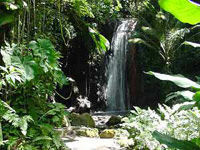 Life has its rewards and you will find many of them on the Gros Piton Nature Trail. Travel by coach along the scenic west coast of the island through lush tropical vegetation onto the Fond Gens Libre, (village of the free people). From this point, you are joined by a knowledgeable guide, who will lead you along the trail which winds around the mountain at a gradual gradient. Enjoy panoramic vistas in every direction and see Petit Piton in the distance. The first half of the trail is moderate and can be enjoyed by everyone, while the second half involves a steep accent to the summit suitable to the more adventurous hiker. After a strenuous but exhilarating climb and a delightful lunch at a local Restaurant, return to the bus for the ride back to your hotel. Tour departs from your North Island hotel or the cruise ship port. 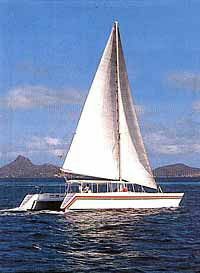 Spend the day sailing aboard a beautiful catamaran along the tropical west coast of St. Lucia. Go ashore to see the island's landmark, the Pitons, soaring over 2,000 feet (600 meters) in the air. Visit the Diamond Botanical Gardens and explore the natural beauty of the waterfalls before heading to the Sulphur Springs inside the Caribbean's only drive-in volcano. You'll also have time to relax, swim and snorkel in the warm tropical water. Explore St. Lucia by both land and sea to experience the true beauty of this island. Start with an excursion to Morne Fortune, see banana plantations, fishing villages and rich tropical vegetation before arriving at Soufriere, home of the landmark Pitons. On this St. Lucia adventure tour, you'll have the opportunity to visit the Sulphur Springs, Diamond Waterfalls and Botanical Gardens. After lunch, return by boat, cruising the coastline with a stop to swim and snorkel. Enjoy "the best of both worlds" as you experience the quaint and beautiful landscape of the island by coach and the spectacular coastline by boat. This excursion has been described by many as "exciting", "scenic", "informative" and "great value for money". Drive through the banana plantations, the tropical vegetation and two fishing villages on the outskirts of the rainforest. Then, descend into Soufriere, home of the beautiful and spectacular "Pitons". Visit the Sulphur Springs in the drive-in volcano and the amazing Diamond Botanical Gardens, where tropical flowers grow in profusion. Stop for lunch at "The Still", a plantation styled restaurant before joining a boat for the return journey along the island's fascinating coastline. Stop to swim or snorkel and cruise to beautiful Marigot Bay. Return to the dock where the bus will be waiting to take you back to your North Island hotel. Departure Point: Tour departs from your North Island hotel or the cruise ship port. 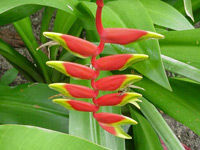 This tour is a fascinating exploration of St. Lucia and all it has to offer. You'll start by driving to the town of Soufriere to visit the famous Pitons. Continue through banana plantations, fishing villages and tropical rainforests to visit the Sulphur Springs and the Toraille Waterfalls for a quick swim. Finish this great tour of St. Lucia with a stop at the Fond Doux Estate to walk the trails of a working plantation. Drive through the banana and coconut plantations, the sleepy fishing villages of Anse La Raye and Canaries and along the island's west coast road to the magical town of Soufriere. Visit the Caribbean's only drive-in volcano with its bubbling Sulphur Springs and see the famous Pitons as they rise majestically out of the sea. Travel onwards to the Fond Doux Estate where you'll walk along meandering trails of this working plantation. Journey through a tropical fruit garden past the charming 19th century plantation great house and enjoy fresh fruit and a tropical drink. Toraille Waterfall is your next stop where white torrents of water gush 50ft (15 meters) over a hillside, cascading gloriously into a pool at the center of a beautiful garden. A nature trail leads through this natural tropical garden in a kaleidoscope of color. Enjoy a quick dip in the pool before rejoining the bus which will take you back to your North Island hotel. Hop on an open-back jeep for this full day St. Lucia adventure as you travel along the west coast, venturing through acres of dazzling banana plantations. Visit the 19th-century old Fond Doux Plantation and enjoy an on-site lunch before joining a catamaran cruise for your relaxing return along the island?s beautiful coastline. Enjoy "the best of both worlds" as you experience the quaint and beautiful landscape of St. Lucia by jeep and the spectacular coastal views by boat. You'll journey along the west coast of St. Lucia through banana plantations, two fishing villages and along the winding and picturesque tropical countryside to the town of Soufriere. 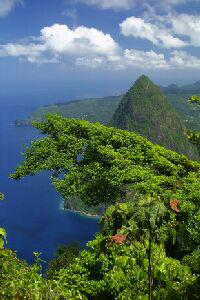 See the Pitons, spectacular twin peaks rising majestically out of the sea. Visit the 19th-century old Fond Doux Plantation and walk along trails of beautiful tropical flora to a local copra house. Here, you'll see how coconut is dried before it is sent on to be processed into oil, margarine and soap. Taste the locally grown cocoa pods and see how they are sun-dried before being shipped out to be processed and served as delicious chocolate bars. Enjoy an on-site lunch and hop on a catamaran for your relaxing return along the island?s beautiful coastline. Stop for a swim before cruising through spectacular Marigot Bay and returning to dock where your jeep will be waiting to take you back to your Castries hotel. Sail the coastline of the tropical island paradise of St. Lucia, watching the sunset and sipping champagne. Let yourself be swept away by the romance and magnificence of the moment - something you have to try at least once in your life. Whether you're an experienced angler or not, this tour will literally have you at the edge of your seat. This deep sea fishing adventure off the coast of St. Lucia will give you the opportunity to catch one of the many fish who are abundant in these waters. As fishing can be very tiresome, beers and sodas will be provided. An excellent excursion for nature lovers! St. Lucia possesses a topography and ecology of stunning beauty, matched by no other location in the Caribbean. Take a short walk along a forest trail to the heart of the lush green forest to experience the tropical flora and fauna up close. A short scenic drive to the lush green forest allows you to enjoy the warmth and quaintness that sums up St. Lucia. You'll be met by an expert forestry guide who will lead you on an awe inspiring nature walk. You'll explore massive Gomier and Blue Ma Haut trees, various species of lichen as they intricately wind their way up large tree trunks, wild anthurim lilies, wild nutmeg and the seemingly endless species of flora and fauna. Savor the privilege of sharing a habitat with endemic birds like the Mangrove Cuckoo and the Black Finch as you stroll through their enchanting and natural sanctuary. There is the chance of seeing or hearing the cry of the elusive "St. Lucian Parrot" and experiencing the thrill of viewing a Boa Constrictor lying in cool indifference on a tree trunk. Experience the spectacular scenery of St. Lucia while flying through the air. Tantalize your sense of adventure as you zip over the lush vegetation on 500 ft (150 meters) of cable, giving you the thrill of a lifetime while you enjoy a bird's eye view of the stunning tropical jungle. A short scenic drive along St. Lucia's east coast brings you to the welcome center situated in the heart of the rainforest. For those less inclined to meandering along a forest trail, but would rather seek a more thrilling adventure, there is little that compares to zipping along 500 ft (150 meters) of cable at heights ranging from 30 ft (10 meters) to 50 ft (15 meters). Enjoy a bird's eye view of the rain forest as you glide over tree tops and rivers and feel the thrill of "flying" through lush tropical vegetation. Reawaken your sense of adventure on this stunningly breathtaking ride which will leave you with a renewed appreciation of nature. Return to the start up point where you'll join the bus for the scenic ride back to the hotel. There's a little bit of something for everyone in St. Lucia and this shopping tour will prove exactly that. From the finest timepieces, china, crystal and jewelry, this island has local shopping attractions galore. Visit the duty free Seraphine Center for a wide variety of souvenirs at reasonable prices. Choose from a wide variety of shops including Colombian Emeralds and Harry Edwards for fine jewelry, Clear Blue for silver jewelry and local art pottery by a renowned St. Lucian artist. There are twenty eight other stores offering fine merchandise from which to choose. You'll have the opportunity to browse the craft market where you can shop for local crafts made exclusively in St. Lucia. Then onto Caribelle Batik, renowned for its colorful batik prints and beautiful silk clothing. This stop is a delight in itself. Your final stop is The Gablewoods Shopping Mall with its supermarket, liquor store, bookstore and a selection of other shops and boutiques. Don't forget to take along passports and airline tickets for duty free purchases. Take a drive to Soufriere and on the way discover the beauty and magic of St. Lucia. The scenic drive will have you winding your way through banana plantations, tropical vegetation and traditional fishing villages. Upon arrival in Soufriere, admire the spectacular twin Pitons before visiting the Sulphur Springs, Diamond Botanical Gardens and the breathtaking natural waterfalls. You'll have the opportunity to drive through two traditional fishing villages along the west coast of St. Lucia before heading to the highly celebrated town of Soufriere to enjoy a breathtaking view of the world renowned majestic twin peaks known as the Pitons. Visit the Sulphur Springs in the Caribbean's only drive-in volcano and stroll through the enchanting Diamond Botanical Gardens. Explore the hot mineral waterfalls and prepare to be amazed by the natural beauty that surrounds you. One of the Windward Islands of the West Indies' Lesser Antilles, Saint Lucia is nestled halfway down the eastern Caribbean archipelago. The "Helen of the West Indies," Saint Lucia is known for its natural beauty and diverse attractions, including the signature Piton Mountains (a UNESCO World Heritage Site), a tropical rainforest and one of the world's few drive-in volcanoes. Although Saint Lucia is on the Eastern Caribbean Dollar (ECD) traded at roughly ECD 2.70 to the U.S. Dollar, the U.S. Dollar, Canadian Dollar, Euro and GBP are readily accepted. Diving is especially good in Saint Lucia. Warm, clear waters give you the perfect setting for colorful fish and coral reefs. Culturally rich offerings include the bustling marketplace in the capital of Castries, quaint fishing villages along the coastline, and the annual Saint Lucia Jazz festival are also a draw. Saint Lucia's wide range of accommodations includes world-class five-star resorts, all-inclusive resorts, intimate inns and value-oriented properties.